Freedom Rockz: Hey You! 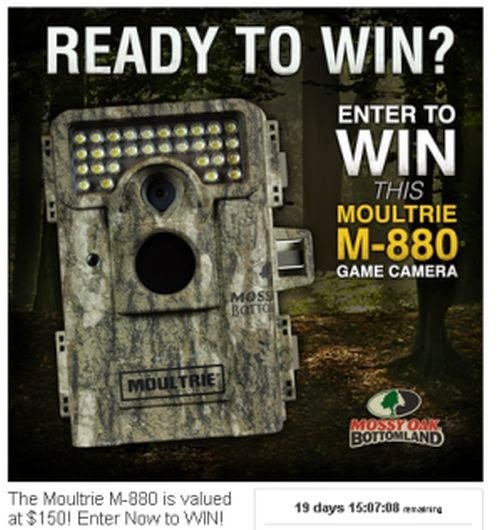 Enter to Win this Mossy Oak Game Cam! Hey You! Enter to Win this Mossy Oak Game Cam! The Moultrie M-880 is valued at $150! Enter Now to WIN! This cutting edge camera has tons of features! Includes an 8 megapixel camera, HD video recording, low glow nighttime Infrared illumination, 1 second trigger speed, and Bottomland camo for ultimate concealment! **Please remember to enter a valid email address! The winner will be contacted through the email address that he/she enters. Click the link below to go "Like" Mossy Oak to enter.